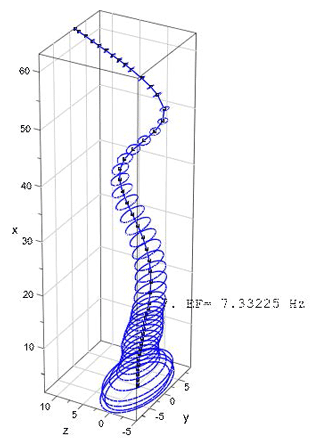 When simulating a wind turbine, the lowest eigenmodes of the rotor blades are usually used to describe their elastic deformation in the frame of a multi-body system. In this paper, a finite element beam model for the rotor blades is proposed which is based on the transfer matrix method. Both static and kinetic field matrices for the 3-D Timoshenko beam element are derived by the numerical integration of the differential equations of motion using a Runge–Kutta fourth-order procedure. 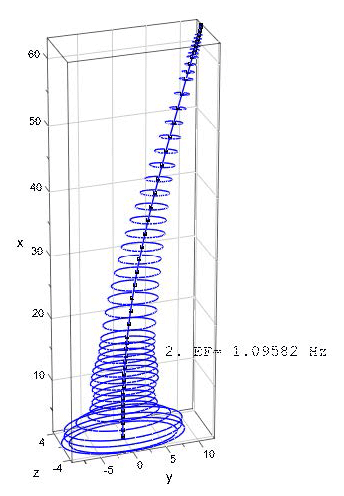 In the general case, the beam reference axis is at an arbitrary location in the cross section. The inertia term in the motion differential equation is expressed using appropriate shape functions for the Timoshenko beam. The kinetic field matrix is built by numerical integration applied on the approximated inertia term. The beam element stiffness and mass matrices are calculated by simple matrix operations from both field matrices. The system stiffness and mass matrices of the rotor blade model are assembled in the usual finite element manner in a global coordinate system accounting for the structural twist angle and possible pre-bending. The program developed for the above-mentioned calculations and the final solution of the eigenvalue problem is accomplished using MuPAD, a symbolic math toolbox in MATLAB®. 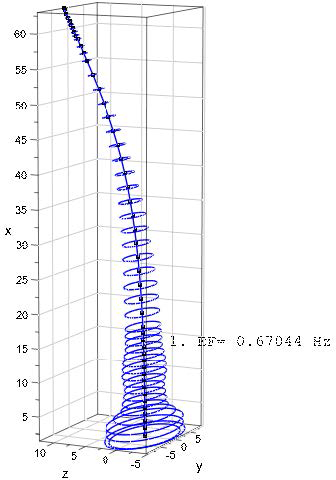 The natural frequencies calculated using generic rotor blade data are compared with the results proposed from the FAST and ADAMS software. 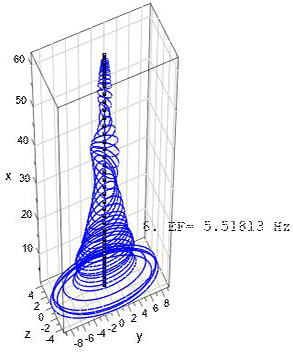 Stanoev, E. and Kusuma Chandrashekhara, S.: Determination of natural frequencies and mode shapes of a wind turbine rotor blade using Timoshenko beam elements, Wind Energ. Sci., 4, 57-69, https://doi.org/10.5194/wes-4-57-2019, 2019. 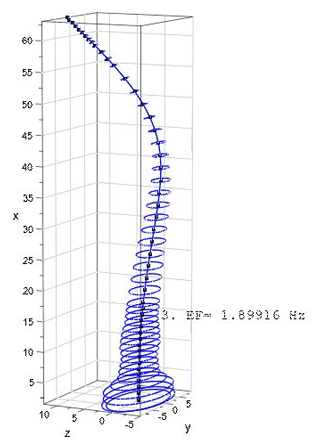 Vibration of an elastic system refers to a limited reciprocating motion of a particle or an object of the system. 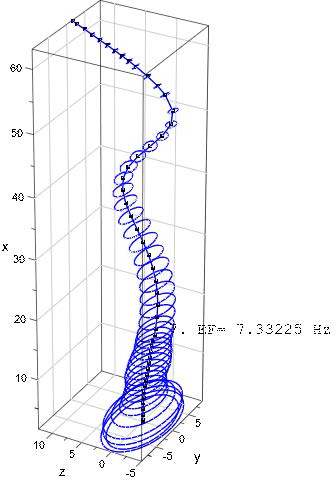 Wind turbines operate in an unsteady environment which results in a vibrating response (see Manwell et al., 2009). They consist of long slender structures (rotor blades and tower), which result in resonant frequencies that should be taken into account during the initial design and construction. 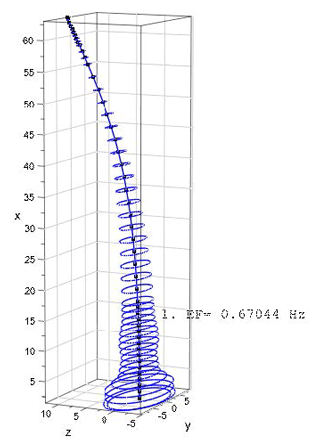 When the excitation frequency of the vibrating system is near any natural frequency, an undesirable resonant state occurs with large amplitudes, which may lead to damage or even the collapse of the wind turbine or its components. The vibration response, especially of the rotor blades, depends on the stiffness which is a function of the materials used, the design and the size (see Jureczko et al., 2005). 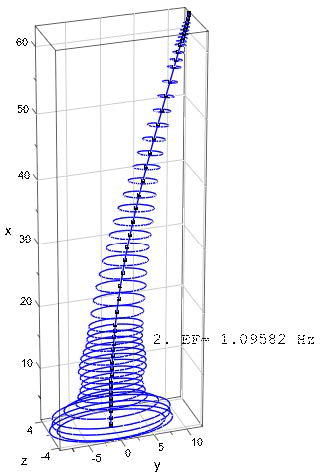 Therefore, the estimation of natural frequencies in the early design phase plays an important role in avoiding resonance. 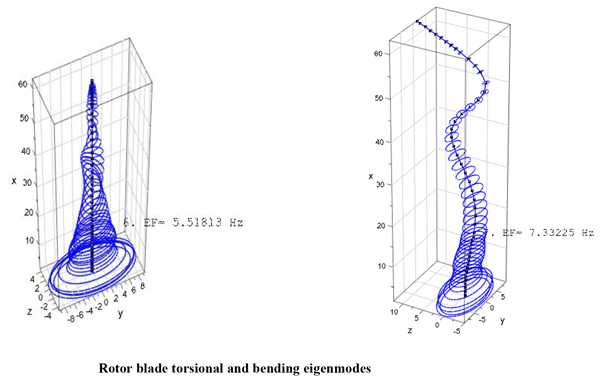 The eigenmodes associated with the lowest natural frequencies are employed as shape functions to describe the elastic deformation of the rotor blade beam model in the frame of the usual simulation of the wind turbine as a multi-body system. Generally, the first two bending eigenmodes in each direction (flapwise and edgewise) and optionally the two additional torsional eigenmodes are used. The determination of the lowest eigenmodes with sufficient numerical accuracy is the first step with respect to the modal superposition applied to the deformational motion of the rotor blades. Due to the geometrical complexity of the blade cross section profiles and the extended use of composite materials, the exact calculation of natural frequencies in the design process takes a considerable amount of time and financial expense with regards to the 3-D modelling of the rotor blade using CAD software; hence a simplified finite element beam model is necessary. A twisted rotor blade is simplified into a cantilever beam with a non-uniform cross section. The structural twist angle is implemented by changing the orientation of the principal axis of the blade cross section along the length of the blade. where M(e) is the element mass matrix, ρ is the mass density, v is the volume and a is the matrix of interpolation functions. Using the above-mentioned standard relations and appropriate shape functions for the Euler–Bernoulli beam and the Timoshenko beam, the stiffness matrix and consistent mass matrix for the finite beam element can be derived. However, an alternative to this procedure, based on the transfer matrix method for the beam theory (see Graf and Vassilev, 2006:69–88 and Stanoev 2007) is developed in the present article. The element stiffness matrix can be derived on the basis of numerical integration of the first-order ordinary differential equation system for the differential beam element. The associated mass matrix can be developed by numerical integration of the inertia term in the differential equation of motion. The numerical integration results in static and kinetic field matrices, from which the element stiffness and mass matrices can be easily assembled. In the present article, the above-mentioned procedure is used to determine the element stiffness and element mass matrix for the Timoshenko beam. The interpolation functions used for deriving the mass matrix are based on Hermite polynomials according to Bazoune and Khulief (2003). The system stiffness and mass matrices for the rotor blade are assembled in a global coordinate basis in the usual finite element manner. The numerical solution of the associated eigenvalue problem for the system without damping is computed using computer algebra software (in the frame of MATLAB®). In Sects. 2 and 3, the proposed method is described in detail; in Sect. 4 the method is applied on a rotor blade structure with 288 degrees of freedom (DOFs). The results for the natural frequencies and the corresponding eigenmodes are compared with the results calculated using the FAST and ADAMS software. 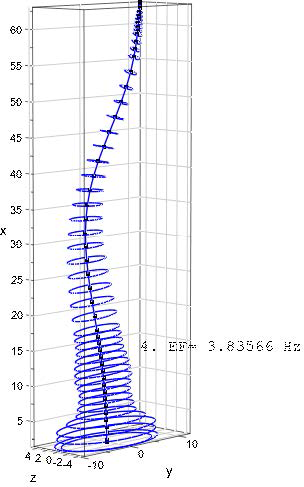 The beam reference (longitudinal) axis is at any arbitrary location of the cross section. The only stresses that occur are normal stresses σx and shear stresses τxy, τxz. Cross section planes, which are initially normal to the longitudinal axis, will remain plane after deformation. Figure 1Deformation at the point (x,y,z) (see Andersen and Nielsen, 2008). where γz and γy are the constant shear strains that are not neglected in Timoshenko beam theory. where N is the axial force, Mz and My are bending internal moments, Qy and Qz are the corresponding shear forces and MTP is the St. Venant torsional moment. Here, Asz=αsz⋅A and Asy=αsy⋅A are the shear areas in the z and y directions respectively, αsz, αsy are the corresponding shear correction coefficients, A is the cross-sectional area, Ay is the static moment with respect to the z axis, Az is the static moment with respect to the y axis, Ayy is the moment of inertia with respect to the z direction, Azz is the moment of inertia with respect to the y direction, Ayz is the deviation moment of inertia and IT is the torsional moment of inertia. The relation described in Eq. (10a) and (10b) implies that the chosen reference axis coincides with the shear centre due to neglected shear–torsion coupling terms in Eq. (7). Figure 2The finite beam element: internal forces and nodal DOFs. The virtual work relation in Eq. (7) is rewritten for the case where the beam coordinate system coincides with the principal axis of the cross section – see Eq. (11). In the classical finite element formulation, the beam stiffness matrix and the consistent beam mass matrix are derived by developing an approach for the displacement functions through shape (interpolation) functions, which consist of first- and third-order Hermite polynomials. 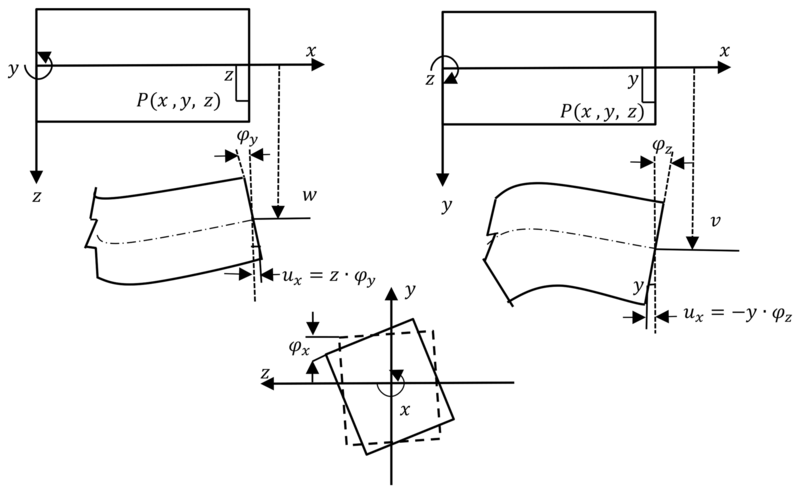 In this section, an alternative finite element procedure is presented, based on the numerical Runge–Kutta fourth-order integration of the differential motion equations. The integration of the static part (the coefficient matrix in Eqs. 13 and 14 respectively) leads to the static field matrix, while the integration of the inertia terms in the equation of motion Eq. (16) results in a kinetic field matrix. In the last step of the integration, using both field matrices, the respective element stiffness and the element mass matrices can be calculated using simple matrix operations. z1=uxvxwxφxxφyxφzxT(16a)is the vector of the displacement functions, andz2=NxQyxQzxMxxMyxMzxT(16b)is the vector of internal (section) force functions. where z¨1=u¨v¨w¨φ¨xφ¨yφ¨zT is the vector of accelerations, [Φ1(x) Φ2(x)]ϵR(6×12) is the matrix of interpolation functions (see Sect. 3.3), V¨a,V¨bϵR(6×1) is the vector with nodal accelerations and mϵR(6×6) is the inertia matrix of the differential beam element (see Sect. 3.2). where Θp, Θy and Θz in (kg m) are the mass moments of inertia for the cross section. The acceleration term z¨1 in Eq. (17) is expressed using the product of Hermite interpolating polynomials and the nodal acceleration vectors V¨a and V¨b. Figure 3Definition of the dimensionless coordinate (ξ) of a beam element. where the products of both matrices Nw and Gw are introduced as functions Hwj(j=1,…,4). In Eq. (32), the functions Hφyj (j=1,…,4) are introduced in an analogous manner. A similar method is used for determining the approximation functions v(ξ) and φz(ξ) for bending deformation in the xy plane. The special form of the numerical Runge–Kutta fourth-order integration method applied here is described in detail in Müller and Wolf (1975) and Schenk (2012). The integration operator is applied to the equations of motion in Eq. (16), i.e. The integration operator is subsequently applied to the evaluated coefficient matrix A at each interval by excluding the initial state vector z(a). The result are static field matrices F(x,a), multiplicatively linked to z(a) see Eq. (40). Therefore, each F(x,a) matrix “transfers” the state vector at location (x=0) to the end x of the integration interval considered (transfer matrix method). In the frame of the integration procedure the actual field matrix F(x,a) serves column wise as an initial vector for the next interval, and the components of the state vector z(a) remain excluded. 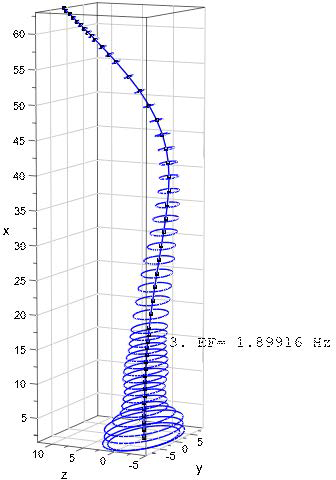 The beam “load” vector b1b2, Eq. (38), evaluated in the actual interval, yields the β1β21 column in the F(x,a) matrix after integration – Eq. (40). Figure 4Eccentrically applied mass mE at the xAE point of the beam in the 3-D case. According to Eqs. (13) and (14) the state variable z1 represents six-component displacement vectors for V(a) and V(b), respectively, and the state variable z2 represents six-component internal forces vectors S(a) and S(b), at locations (x=0) and (x=L) respectively. where NL and NR are internal force vectors on the left and right in differential proximity to the point at location x, ML and MR are internal moment vectors on the left and right in differential proximity to the point at location x (see Fig. 4), mE is the eccentric single mass, ΘEi are the mass moments of inertia of the single mass and φ¨i are the angular accelerations at location x. The additional inertia matrix MEmE,ΘEi,x,xAE, derived from Eq. (44a)–(44b), is analogous to the inertia matrix due to distributed mass in Eq. (18). 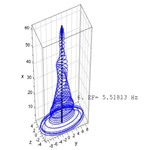 During the numerical integration within the beam element (see Sect. 3.4) an additional eccentric inertia term has to be added to the kinetic field matrix at the end x (the point of application of eccentric mass) of the corresponding integration interval – see Eqs. (40) and (45). 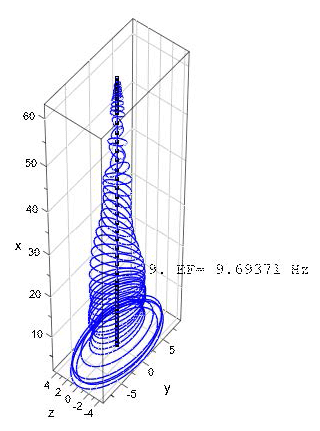 Single masses do not usually appear in a rotor blade model, but the same finite element may be used for the modelling of wind turbine towers. In this case single masses within a finite beam element could represent bolted ring flange connections or the mass of any equipment, such as lifts etc. Table 1First three calculated (bolded values) flapwise and edgewise eigenfrequencies. Table 2Comparison between Timoshenko and Bernoulli beams with three variants for shear stiffness values. 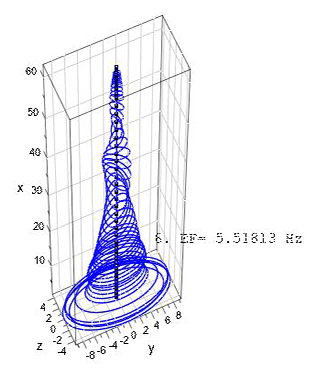 The n-grade characteristic polynomial pω0k2 has n real solutions ω0k,k=1,…,n (eigenfrequencies) and n associated eigenvectors q^k, calculated from Eq. (49). For real-life tasks the solution is usually acquired by use of eigensolver software. The programming code for the procedure and the graphic plots described/shown below was written in MuPAD, a symbolic math toolbox in MATLAB® (see Kusuma Chandrashekhara, 2018). The code was verified using realistic data for a wind turbine rotor blade. The blade structural data belong to a 5 MW reference wind turbine designed for offshore development (Jonkman et al., 2009). The blade is 63 m in length and is divided into 48 beam elements. The blade structural data consist of distributed mass (mL), blade extensional stiffness (EA), flapwise stiffness (EAzz), edgewise stiffness (EAzz), torsional stiffness (GIT), flapwise mass moment of inertia (Θy) and edgewise mass moment of inertia (Θz). Due to the lack of shear stiffness data in Jonkman et al. (2009), the values of (GAsz) and (GAsy) (used for the calculations in Table 1) – the respective edgewise and flapwise shear stiffness – are estimated to be 10 % and 20 % of extensional stiffness (EA), respectively. The values of the above-mentioned stiffness and mass moment of inertias are specified at spanwise locations along the blade pitch axis and about the principal axes of each cross section as oriented by a twist angle (γ) defined in the input data. The twist angle is incorporated using the rotational transformation of each local element stiffness and mass matrices into the global coordinate system. The results of first three (flapwise and edgewise) eigenfrequencies calculated using the Timoshenko beam model (see Kusuma Chandrashekhara, 2018), are compared with the proposed results from FAST and ADAMS in Jonkman et al. (2009). The results are as shown in Table 1. The mode shapes and the corresponding eigenfrequencies for the first flapwise and edgewise eigenmodes as well for two torsional eigenmodes are as shown in Figs. 5–11. In Table 2 the calculated natural frequencies for three different variants of the shear correction coefficients are shown, approximated as GAszEA or GAsyEA ratios. The comparison with the frequencies calculated using the Bernoulli beam model outlines the tendency toward a stiffer structure due to the presupposed infinite shear stiffness in this case. Natural frequencies fBern are 0.5 %–1.0 % higher on average than fTim – in the (30 %, 60 %) case. The natural frequencies remain unchanged for both beam models for the purely torsional modes only. The reason for this is that the equations for torsion and bending are uncoupled (for the case of the principal axes, see Eq. 14) and remain the same in both models. The proposed Timoshenko beam element in the 3-D description has been developed on the basis of the transfer matrix method. Both static and kinetic field matrices for the beam element are derived by applying a Runge–Kutta fourth-order numerical integration procedure on the differential equations of motion in a special way. 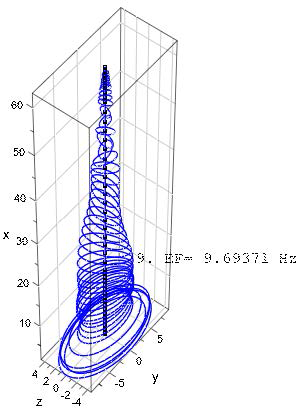 Appropriate shape functions for the Timoshenko beam have been used to approximate the inertia forces in the motion differential equation. The beam element stiffness and mass matrices are assembled by matrix operations from the derived element field matrices. The usual finite element equations of motion for the rotor blade model are cast in the general case accounting for the structural twist angle and possible pre-bending. Therefore, in the general case the rotor blade beam model represents a polygonal approximated space curve. For the sake of verification, the natural frequencies and associated eigenmodes are calculated using real-life rotor blade data with the incorporation of realistic twist angle data. 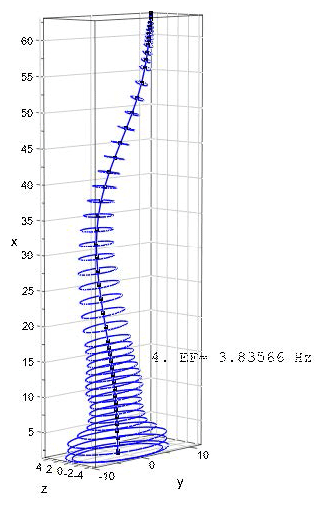 The first two edgewise and flapwise eigenfrequencies obtained are compared with the proposed results from FAST and ADAMS software given in Jonkman et al. (2009). It can be observed that the deviation of the results of the Timoshenko beam model from FAST is comparatively lower and is in good agreement with FAST; thus, it can be stated that the approach presented regarding alternative finite element formulation works well. 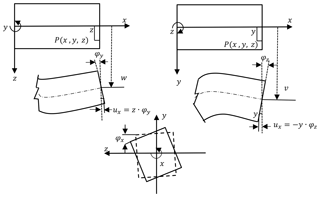 One key input parameter for the Timoshenko beam model is the shear stiffness. As it was not the main goal of the present work to determine an appropriate shear correction coefficient for realistic rotor blade data, the numerical example was performed with a very rough approximation for GAsz and GAsy. This was done in order to simply demonstrate the performance and the differences to the Bernoulli beam model. However, if detailed data for the complex multilayer design of a rotor blade were available, a more realistic estimation of the shear stiffness could be expected. A workable method for the determination of the shear correction coefficient of a real-life rotor blade represents an important topic for further research. Data used in this work as rotor blade structural data for the numerical example are publicly available at https://www.nrel.gov/docs/fy09osti/38060.pdf (last access: 25 January 2019; Jonkman et al., 2009). The MATLAB® program code written to calculate the rotor blade is available upon request. ES led the underlying master thesis (Kusuma Chandrashekhara, 2018) and developed the overall method theoretically by the use of the sources referenced. SKC developed and wrote the code for the Timoshenko shape functions used in the inertia term. He composed the MATLAB® code using different existent code parts and optimized many of the procedures. SKC also performed the calculation and the graphic plots of the numerical example.